KEY BENEFITS: Less than 50% of new firms survive the 4-year mark, therefore writing a sound business plan and working that plan effectively is essential. This book addresses the key elements in an effective business plan including start-up costs and financing, personnel, financial statements, marketing, legal issues and insurance. Filled with real world examples, it includes actual business plans, current business opportunities in emerging markets and interesting case studies to help readers test their own entrepreneurial ideas. The latest research regarding the decision to become an entrepreneur is particularly helpful to anyone considering their own business. Each book includes a companion CD-ROM to reinforce concepts. 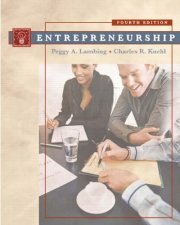 Basic entrepreneurial concepts including how to enter a market i.e. start-up, buying an existing business, franchising, etc. along with the feasibility of each. Includes specific updates and obstacles regarding women-owned and minority-owned businesses; the pros and cons of home-based businesses; special considerations of entrepreneurship; and legal changes in overtime pay. New product development and growing a business are also discussed. Includes an outstanding step-by-step template for writing a business plan. THE A great resource for anyone interested in starting a business.